Dubbed in Darija . . .
Last weekend I watched Diablo, a telenovella from Spain (I think) that’s set in New York and dubbed in Darija. The clip above is from the show. As a New Yorker, a new resident of the Maghrib and a language obsessionista, it was really fun to watch Diablo, even if I could only recognize a word here and there. Today, I found this article discussing the debate about Darija dubbing — and I think it’s an excellent introduction to the linguistic situation in Morocco. Which is to say: here, all matters of language are extremely complicated. First, the official language of Morocco is Arabic. I’m under the impression this is Classical Arabic, which is the language of the Koran and therefore the language of prayer and of religious discussions. Fusha is Modern Standard Arabic, which is…obviously, modern. This you might hear on Al Jazeera, or other news and radio programs. What’s spoken on the streets, in cafes and otherwise out and about, however, is Darija. This is a dialectical form of Arabic. Egyptians, for example, speak a different dialect, which is more widely understood among Arabic speakers, primarily because of popular Egyptian films. I’m told Moroccan Arabic has similarities to Fusha and Egyptian Arabic in some ways, but that ultimately, they’re totally different languages. Moroccan’s don’t venerate Darija the way you might expect, which is why dubbing television shows into Darija causes a bit of a debate. In Italy, everything was dubbed and everyone was happy about that. This picture of language is further compounded by Tamazight, the native Berber language of Morocco. Tamazight, of course, has it’s own subset of dialects that range in the degree to which they are similar and understood between regions. And we though the US was the melting pot! If these languages aren’t enough, add French to the mix. When I mentioned the official language is Arabic, I didn’t tell you that the official declaration in the constitution was penned in French. French is the language of diplomacy and business here, but it’s also on the street and peppered throughout Darija. Sentences — at least when it comes to me — rarely start and end in the same language. And a lot of Moroccans speak English. Those who don’t, often seem to want to learn. I should point out that this is specific to spoken language. Matters of literacy are even more complex and deserve their own post. It’s conceivable that a Moroccan who speaks five or more languages, will have trouble reading in any of them. My friend, Matt, jokes that everyone here is a professor of linguistics and when he flatters taxi drivers with this comment, they laugh and laugh. But it’s true. I asked a policeman for directions the other night and instead I got a jovial lecture about how I need to learn Arabic or French or both, even when I insisted in Arabic that I was learning the language slowly. But he also wanted to know how is English sounded. I told him it was better than mine, and he explained that he’d learned it from the movies. And it still took me 45 minutes, 3 languages and texting friends for vocabulary words to walk 10 blocks. Swapping Nouktas in the Desert. My first joke was a tale I borrowed from Alvin Schwartz’s Scary Stories to Tell in the Dark. I was probably 7 or 8 and I was so ridiculously good at recounting it that my mom would make me tell it to adults at parties. Maybe you know the story? Five Bloody Fingers? If you don’t, it’s a doozy of a fireside yarn, and like any good southern storyteller, I performed it with so much flare that it eventually became my own. You see, I come from a long line of folks on both sides who know that jokes are essential commodities in just about any situation. Both my grandfathers had hundreds of jokes and riddles up their sleeves. And, when I was as a kid my dad even gave me a book called Get Thee to a Punnery – though perhaps the hilarity of the title was somewhat lost on me at the time. Most of you know all this, though, since you’ve likely groaned a time or two in my general direction. So it should be no surprise that one of the first words I’ve learned on this adventure is Noukta, the Darija word for joke. Moroccans, as it turns out, are hilarious jokesters and natural storytellers. On our ETA trip to the Sahara, we heard a handful of riddles in lots of scenarios, from the barefoot Berber boys who led us through the dunes, to the guy we met in a drum circle, who said his name was one year long. How do you get a camel into a refrigerator? Open the door. Walk the camel in. Close the door. (though, our narrator added this alternative punchline: wait till the end of Ramadan, then leave a plate of food in the fridge and the camel will walk in by himself). And don’t forget the follow up: The lion – the king of the jungle – had a party and all the animals came but one. Which one abstained? The camel, obviously, because he was stuck in the fridge. So far I’ve noticed that people in this country enjoy finessing a story or a joke as much as I do, and they love to laugh. Which is good since I believe that laughing – at myself, at the world, and with other people – is one of my most basic needs. After all, laughter humanizes us, no matter what culture or country we call our own and it exists outside the confines of spoken or written language. Yusef, our very old 4×4 driver, who you can see happily dancing in one of the photos above, didn’t speak English at all. Still, we managed to communicate and laugh together during our trip. The Mohammeds — both our guide and our driver, who work at our language school — were all smiles, all the time. And somehow, those small moments will be as memorable and wonderful as sleeping under the stars in the middle of sand dunes, watching the sunrise from atop a camel, wandering through an oasis, discovering fresh air and green trees in Ifrane, or any of the other activities from a weekend spent driving through the varied terrain of this incredible country. Iftar, meaning the breaking of the fast. Shakrun, meaning thank-you; my first Darija word. 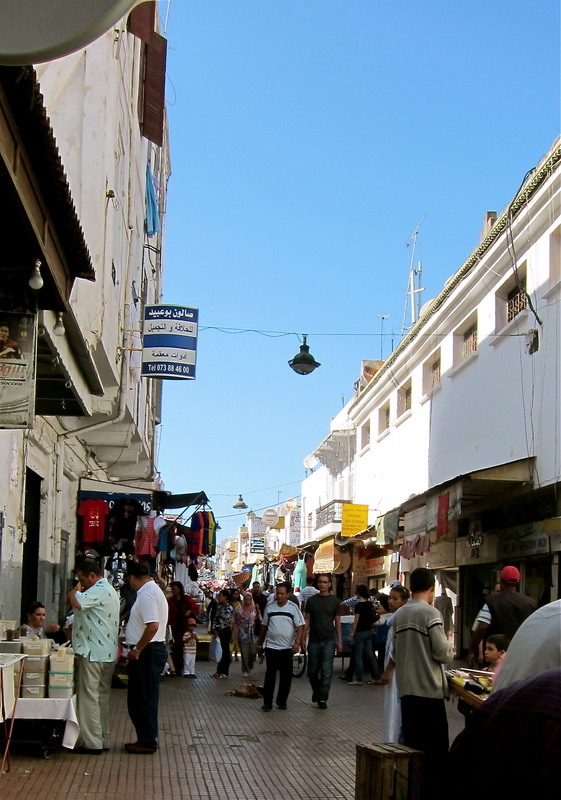 Wandering Rabat’s medina is eerily similar to negotiating Flatbush Avenue: here, like home, the streets are lined with tiny shops and street vendors selling pawned and knock-off wares from cell phones, to pirated DVDs, to piles of shoes, to anything you can imagine, want or need. Suitcases and jerseys hang from awnings; shops boast floor-to-ceiling walls of toiletries. The stench of the fish market, unexpected, may suddenly overwhelm a passerby, but a nearby spice vendor provides a quick burst olfactory relief. As we navigated through the medina on my first afternoon in Rabat, I felt both over stimulated by the new environment and relaxed by the familiarity of it all, as though I was walking through some strange combination of scenes I’ve previously encountered in Italy, Israel and Brooklyn. After our brief medina walk, a few in our number attempted to take care of some business while the rest of us waited near a pastry shop. To work in such a store, I imagine, is some terrible form of torture during the month of Ramadan: the bakers and shopkeepers must endure not only the heat emanating from the ovens, but also the taunting smell of the delicious treats while their bakers are, presumably, fasting. A summer Ramadan means the days are hotter and longer, and the fast that much more difficult. The medina was crowded as the shops were closing for the afternoon in preparation for Iftar. Having landed in Morocco only that morning, my body felt the strain of exhaustion and thirst – but to drink water in the streets would have been too rude to risk. Inside the bakery window, bees swarmed the Ramadan sweets sticky with honey. I had been warned about the children – they are small and fast, they are excellent thieves, they’ll charm you out of all your money – while I’m not ready to make any judgment on the subject, I wasn’t surprised that a little boy with a mysterious plastic bag buzzed around our group asking for something, money, perhaps, or maybe trying to make a sale. No, we said, repeatedly. The little boy was probably seven or eight, and he was the first person to nag us in the medina. Supposedly, the catcalls and solicitations will increase after Ramadan is over, but our afternoon walk had been unhindered. This child, however, persisted with his advances; we continued to say no. 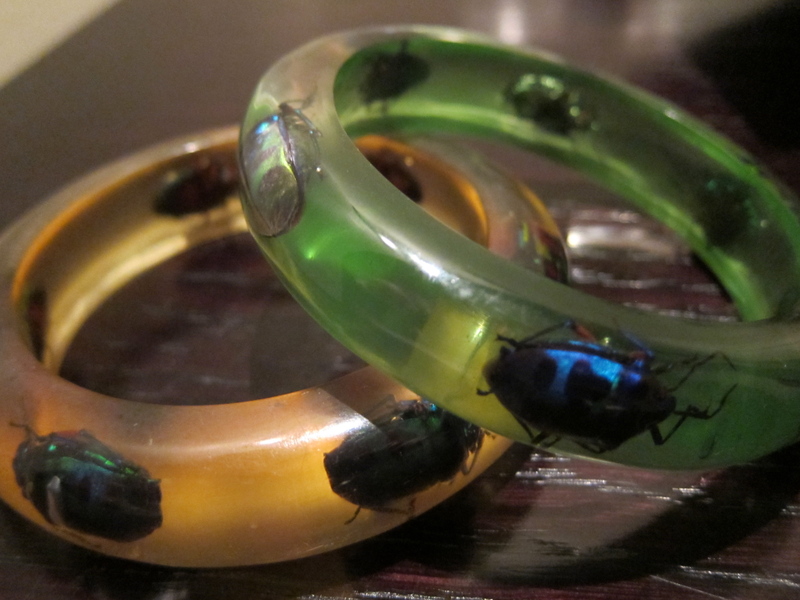 Then, his spied my bracelets. He reached for me, and pointed at the bugs as any small child might. His delight made me smile. He said something excitedly in Darija, which I couldn’t understand. In French, I asked him the word for bracelets. He grinned. Dablej, he said in Darija. I told him shakrun for the new vocabulary word, then tried to speak to him a little more. But he became shy and retreated from our group. Stay tuned for monkeys and my trip to the Sahara….